I think the Sedins just made the whole city of Vancouver cry. Henrik and Daniel Sedin are preparing to begin their 17th season with the Vancouver Canucks. It could be their last. The twins, who turn 37 this month, are entering the last year of their contracts. They haven’t discussed an extension yet. Their team – the only one they have known in their illustrious NHL careers – is rebuilding. Usually that’s a recipe for a trade, particularly for players in search of a first-ever Stanley Cup championship. But not with Henrik and Daniel. The Sedins are as loyal as it comes, and they proved that once again in a heartfelt letter to Vancouver, published in the Players’ Tribune on Monday. All has been quiet on the contract extension talk, and that’s because the Sedins are in wait and see mode. The Sedins are getting up in age, so they likely want to see where they’re at and how they’re feeling before committing to more seasons. They’re in year-to-year territory now. A lot will likely depend on how they’re feeling as players and how the team looks around them. If they’re rare players that can excel at a high level into their late 30s, that probably prolongs their careers. If the Canucks’ young players develop at an accelerated rate, that likely keeps the fire burning too. Henrik says he feels 26, not 36 though, so there’s that. Canucks management has been clear on their position on trading the Sedins. They’re not going to ask them to waive their no-trade clause, and they won’t entertain the idea of dealing them unless Henrik and Daniel ask out. Don’t hold your breath for that. “We are Swedes, but this is our home,” Henrik added. Kevin Bieksa once said he would ‘go down with the ship’ in regards to waiving his no-trade clause. He eventually took a lifeboat to Anaheim, after management asked him to leave. But the Sedins are the captains of this ship, and they’re prepared to sink or swim. Despite the Sedins’ lack of interest in leaving town to chase a Cup, their desire for a championship is evident. And yes, the 2011 Stanley Cup Final still hurts. Daniel said it was still hard to talk about. “It was like climbing to the top of Mt. Everest and then having to turn around with four feet left,” he said. Canucks fans don’t need reminding of what happened in that series. They led 2-0 and 3-2 in the series, but were unable to get the last win. After Game 7, the twins went up to a suite to eat dinner with their families. Despite the pain of 2011, Henrik was able to focus on some positives. “What I want them to understand, is how supportive everyone was to us in the weeks after the Finals,” he said. 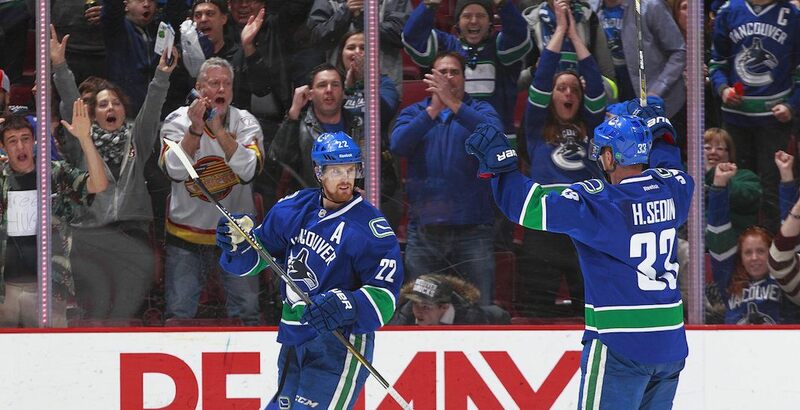 Is this the beginning of the Sedins’ farewell tour? They reflected on their careers as Canucks in the letter. They said they weren’t ready physically when they entered the league, and wondered if they could fulfill their potential. Markus Naslund helped them. They busted their butts in Sweden during the 2004-05 NHL lockout to get stronger and better. When they returned, they toppled 70 points in a season for the first time. They credited Anson Carter, their linemate that year, for helping them get to the next level. The next 10 years, the twins finished 1-2 in team scoring. If Sedin flashbacks are racing through your head, you’re not alone.